Throughout the past several hundred years, Taiwan gave birth to very many national heroes. In attempts to protect, defend and building Taiwan, they suffered suppressions and deaths from colonial powers, and were all misrepresented as bandits, traitors, and violent agitators. Presently, they have obtained Enlightenment and heavenly position, becoming celestial force Who turns the Dharmic Wheel, guarding and blessing Taiwan’s children and children’s children to strive towards liberty, lawfulness and democracy’s path, until Taiwan fulfills the prideful destiny of becoming one of the greatest democratic states in the world. As the colonial power established in Taiwan the so-called Diongliedsuu, and as Japan domestically established the so-called Yasukuni Jinja, for the purpose of deepening and planting our national spirit, the Taiwanese people shall devoutly worship the Taiwanese Martyred Spirits. In order to remember and respect their sacrifice, contribution to, and great love for Taiwan, the children and children’s children of Our country, Taiwan, shall worship Them in every household and shall pray for the Taiwanese Spirits to heavenly bless our country and people to perpetual glory and prosperity. Taiwanese people worshiping the Taiwanese Divinities, such is an immutable truth. Taiwanese people must, with a humble heart and a sincere soul, loyally follow their Predecessors’ spirits of protecting Taiwan, guarding Taiwan, and nation building, as well as to inherit and perpetuate such Heavenly Duty so as to strive from life to death for democratic nation-building in Taiwan. Only then can we ensure our descendants’ unending vitality and eliminate the great cataclysm of ethnic extinction. This scripture conforms to the Heavenly Principles; turns the Dharmic Wheel with the Origin Destiny. Its bestowment upon humanity is to warn Taiwan, Honglaai, that Heaven’s Principles are apparent, that right and wrong are clearly differentiated. For every one of Our Taiwanese children and people shall practice this scripture with self-discipline and self-discretion, to jointly create Taiwanese people’s future. 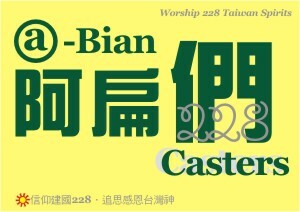 Taiwanese people must walk the Taiwanese way. Therefore, those who recognize and concur with Taiwan, and willingly dedicate themselves to be with Taiwan through life and death, shall obtain Our blessings, shall possess Heaven’s Mandate into eternity, and their descendents’ fortune shall be prosperous and glorious. Comeuppance and fortune are truly classless. Everyone self-invites it. Retribution from good and evil is like one’s shadow; closely follows oneself. The martyrdom of the February 28th Movement, conforms to present day Taiwan’s unending karmic retributions. In between Heaven and Earth, there are divine entities that officially watch over our sins. According to the sins and wrongs that we have committed, They quantify the situation and take the accounting, penalizing with poverty and exhaustion, or encounters of upsets and obstacles. The coming of punishment and comeuppance, even for the major dignitaries and seriously rich, is unavoidable by none. Eventually, the accounting of one’s sins will dry up one’s good fortunes, ceaselessly until death and beyond. We, the Taiwanese Spirits, serving Heaven’s clear Order, and taking Heaven’s Mandate for Divine Intervention, shall have Our Actions realized. 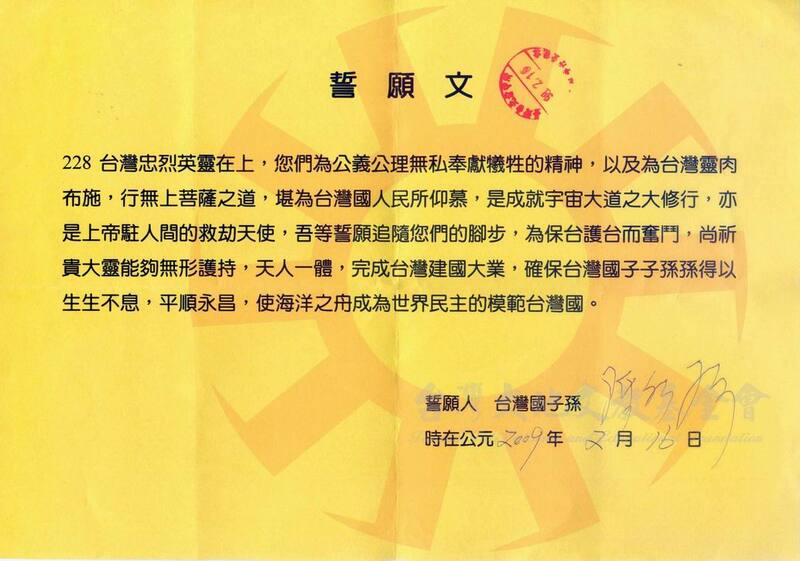 Officially positioned to celestial stewardship, the Taiwan divine entities, having obtained the fruit of supreme Bodhisattva status, divinely intervene among the humanity. Right above peoples’ skulls, They record each and every sinful treason against Taiwan, accordingly curtail a person's life by twelve years or by a hundred days. Additionally are the Tri-Corporeal Divinities, Who reside intrinsically among every physique. Whenever cometh the first and the fifteenth of every moon, They shall report up to the Origin Destiny Divinities, officially ordered and positioned to acting and averting cataclysm; and speak up on peoples’ sins and wrongs de maximus of anti-Taiwan and betraying Taiwan. Doubly in check by Martial Divinities officially positioned day and night, to mark out and report from moment to moment. Whatever the evil doings and evil deeds, all shall emerge visibly. Those who guard our country and protect Taiwan are respected by all in Heaven. Propitiousness, too, shall follow. All evils shall abandon afar. Innumerable spirits shall protect and bless them. All the doings of righteous ways of democracy, upheld by the Origin Destiny’s Heavenly Principles, shall achieve the Great Bodhisattva of Taiwan as the fruit. Such is cultivating action, is truthful action; is a Shepherd who truly achieve the great vows. Wishing others to fail, destroying others’ successes, risking others for one’s own securities, stealing from others to benefit oneself, bringing the worthless to trade for the precious, abandoning the public interests for personal gains, claiming others’ talents for personal credits, covering up others’ virtues, revealing others’ unsightliness, assaulting on others’ privacies, exhausting others’ goods and moneys, breaking up others from their loved ones, infringing others’ beloved, assisting others in wrong doings, exercising privileges to exert personal whims, slandering others for victories, possessing in hearts full of sinister plots, putting down others’ strengths, ignoring one’s own shortcomings, wielding whims to oppress and threaten, condoning violence, killings, and assaults; such learned persons, using the Greater China imperial unificationist conceptions, as coercions to oppress the weak, to pronounce mouthful, tongueful of demonic, deceiving languages, to argue in fallacy without differentiating rights and wrongs, preferring to be conniving and vicious villains: shall descend into the abyss full of horrors, crushing mountains, bloodiness, and filth; in as many as ten thousand lives, shall remain karmically futile to obtain physical incarnations. The current life’s retribution, swift and furious it cometh. Further eyeing Honglaai, the Island of Immortals, having fallen to such, Taesiong likewise pronounces, of which We sense the same: coercive and unrestrained taking, without heeding integrity and shamefulness; persons placed as civil servants or public representatives, yet disposed to encroaching and obsessed with larceny, plundering and looting to victims’ detriments, accumulating wealth with special privileges, conniving schemes to obtain promotions, delivering rewards and punishments without fairness, glutting hearts and guts with lust, indulging excessively in complacency and entertainment, harrowing and torturing the subordinates, terrorizing and extorting fellow civilians, being whimsical and being spoiled, amply mouthing benevolence, justice, and virtues, yet deep in bones are licentious men and lewd women; often complaining to Heaven and blaming others, scolding the wind and chiding the rain without meditation and introspection, habitually blaming personal faults on others, urging people into conflict, recklessly cliquish without minding greater good, embracing new favors yet neglecting the old benefactors, saying in his mouth what is not in his heart, blatantly coveting for wealth, deceiving superiors upon groundlessness, inventing evil talks, defaming others’ reputation and fidelity, fabricating rumors to induce incidents, destroying others’ reputation and fidelity, while assuming one’s own character is righteous, whimsically excoriating divinities and angels while assuming oneself as fair, righteous, incorruptible, and insightful, abandoning Heaven’s Principles, idolizing vice and deviltry. Betraying those close by to please distant people, without heeding the moral of when consuming water appreciate its source. Hence, Taesiong openly speaks: dare to point at heaven and earth that they may witness one’s evil designs, and to call upon divinities and angels to observe one’s degrading deeds, all commit sins without bounds, and without possibility of turning back. Moreover, all those who have extorted unfair and unrighteous wealth, they must compensate for it by pawning the fortunes of their wives, children, and family members; even unto death. Those who do not die are further inflicted with disasters of water, fire, theft, loss of goods, disease, slander, and more; until it offsets their illicit appropriations. Furthermore, for those who indiscriminately killed people, it is like soldiers who exchange blades and kill each other. To seize wealth unjustly, is like relieving hunger with poisoned meat, or slacking thirst with poisoned wine. It brings only temporary satisfaction, but ultimately death. Such Taesiong’s pronouncements to awaken people, We fully concur. Therefore, and identifiably, persons placed in the political arena, providing private gains in the name of public interests, abusing and manipulating special privileges, fond of procuring unlawfully; assuming oneself so exalted and eminent as to be above all, the mortal legal order might tolerate pro tem the wrongs, the invisible heavenly retributions shall be apparent and erectly evident; ye children and grandchildren be disciplined and be discreet. Therefore, once ever taken the evil path should oneself repent and rectify. Refrain from doing all evils. Practice and participate in all goodness. With genuine heart and sincere soul, then propitious spirits favorably follow; and comeuppance exchanges for sanctuary. Fortunate souls possess celestial countenances. For those who are willing to protect our country, love our people, and recognize and concur with Taiwan, our Motherland, shall naturally possess Our blessings; obtain holds onto Honglaai’s Immortal Qix, and the Righteous Qix between Heaven and Earth. Under the collective stewardship of innumerable spirits, inherit Heaven’s Mandates and implement their vows; such morally courageous souls whom, with determination, persist to be with Taiwan from life to end, shall achieve the great bodhisattva as the fruit; may receive praising concurrence among heavenly and earthly creations, affecting spirits and divinities, inspiring worlds a great many thousands, wielding in mastery the axis of im and ioong, launching cosmically encompassing new destiny; such verily is the Origin Destiny cataclysmic averting, salvaging children and children’s children in many millions, earthly rooted and greatly enlightened soul. Spiritual cultivation of the common souls, remain habitually attached to the forms of sentient beings; emplaced as dharmic masters, intractable in purging the four forms, orally dispersing the voice of the Holy, yet steadily corrupts in the core, knowing Buddhist principles yet transgress Buddhist principles, knowing holiness yet transgress holiness, knowing discipline yet transgress discipline, knowing wrongs yet transgress to do wrongs, knowing evils yet transgress to do evils; of so very many in sins and wrongs, it is impossible to be free and forgiven. Persons in the political arena, albeit civil services is a cultivating path par excellence, are yet flagrantly selfish, fond of acting in darkness and vices, lack consistency in appearances and insides, badly mislead in teachings of ethics, likewise the society’s many media, incite the public to induce their indulgence, self-servingly exploit the civic instrument, feature vices, killings, prurience, and larcenies to ensnare monies; such demonic utterances, Heaven finds them shameless, Heaven finds them contemptuous. Those who are genuinely Taiwan’s children and children’s children shall solemnly mark Our pronouncements: accentuate innate moral courage, achieve the great vows, walk away from darkness and shadows, display your Taiwanese esprit. We shall be with you. The Taiwanese Martyred Spirits are the earthly rooted Bodhisattvas of Taiwan, as well as the Messiahs whom the Lord sends to humanity. Because of their dedication to planting democracy and human rights in Taiwan, they were sacrificed. Yet, in response to the fortune and prosperity of Taiwanese people and their future generations, they shall be with you once more. Thus, for those who are willing to recognize and concur with Taiwan, cultivate and uphold this Scripture, and vow to be with Taiwan from peace to chaos, life to death; shall naturally possess an indestructible strength, and shall absolutely be protected and blessed. Please solemnly record in your heart.